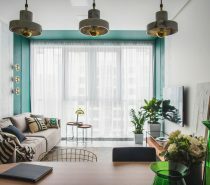 The rich lustre of golden decor touches every corner of this home, visualised by Vlad Yuhimchuk and designed by Zimenko. 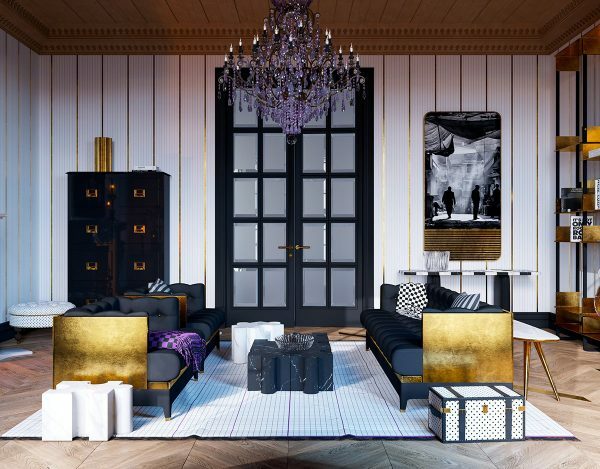 Stand out elements compete for attention with the next bold piece and the next, from a shimmering gold settee and regal armchairs, to unique storage cabinets and bookcases. 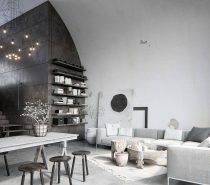 The precious metallic theme even translates down into the minute detail of door hinges, furniture handles, small decorative embellishments and very specifically selected home accessories. 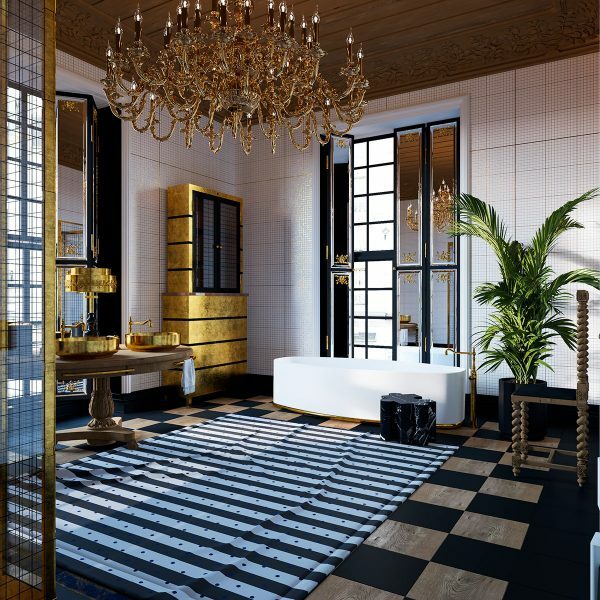 Expect to find the golden touch throughout this whole unusual home tour, which includes a gold living room, gold kitchen diner, a luxe gold bedroom, and a luxurious bathroom that has a set of eye-catching gold basins and matching faucets. 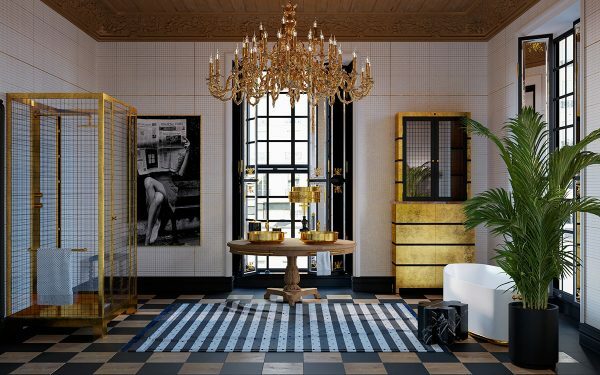 A pair of unique coffee tables make an island of black and white marble in the centre of lustrous golden pieces. A shimmering settee and matching armchairs are backed and trimmed in a gold finish. 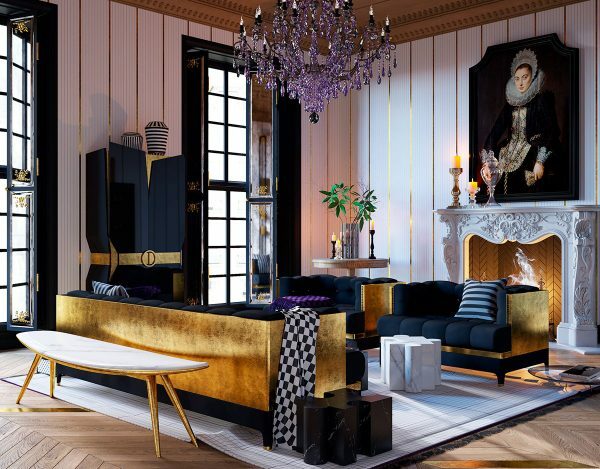 A living room armoire stands tall and regal at the back of the room, belted with gold. 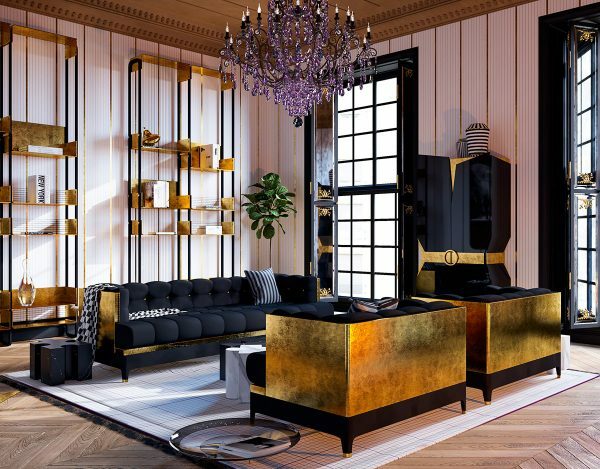 Black gloss cabinet doors and dark seat upholstery make the gold elements really sing out. 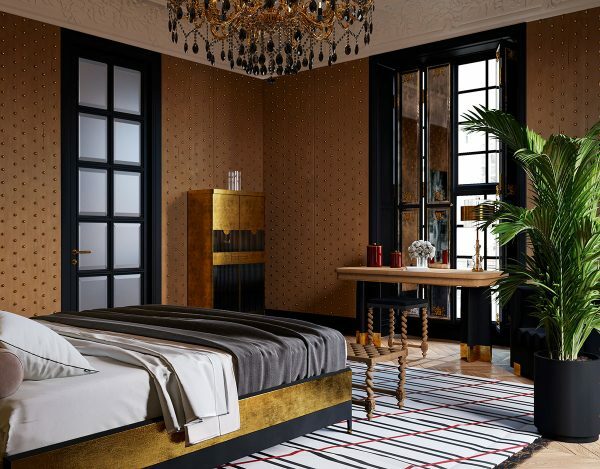 Purple glass beads drip from an impressive chandelier; the deep colour boldly contrasts with and complements the golden furniture and accents in the room. Wall art is underlined in gold, table legs are coated with lustre and even drawer handles have received the midas touch. Small amounts of gold embellishments decorate the window shutters. Gold hinges and handles complete the look. 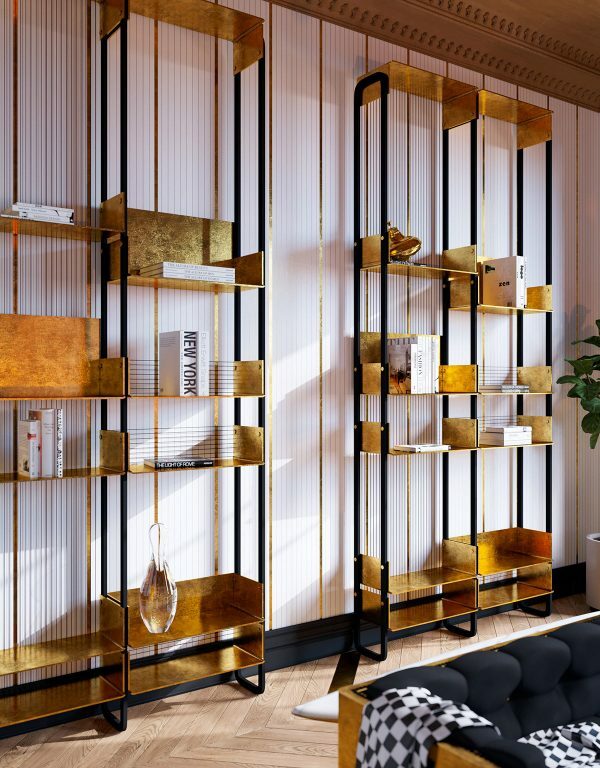 Slender gold bookcases tower up one wall of the room, tying in with the vertical golden stripes than strike down the walls. 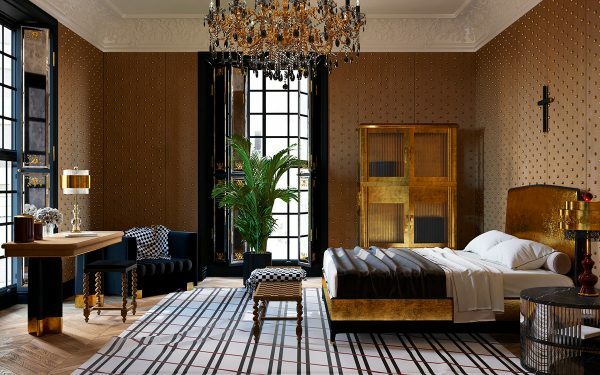 See more ideas for gold accents in interior design. Dining chairs that look fit for a king and queen sit at the head and foot of a long dining table in the kitchen. Gold dining stools take up the rest of the space at the table, which has its legs dipped in gold. A gold chandelier crowns the dining spot. Black kitchen wall cabinets provide a dark backdrop so that the gold and crystal light can really shine. A pair of gold kitchen dressers stand side by side, packed full with white crockery and glassware. Golden grout crisscrosses between white wall tiles around the whole kitchen. 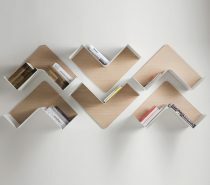 Random pieces of herringbone floor have been given a special accent too. 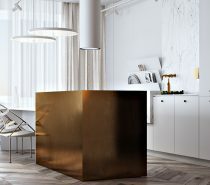 The fridge has an unusual wooden casing – though of course there is a golden element to it also, which is a gold handle; a matching decorative vase adorns the top. The headboard in the master bedroom beams like an early morning sunrise on the horizon. Simple monochrome covers dress the bed. Black and white photography hangs against gold studded wall panels. 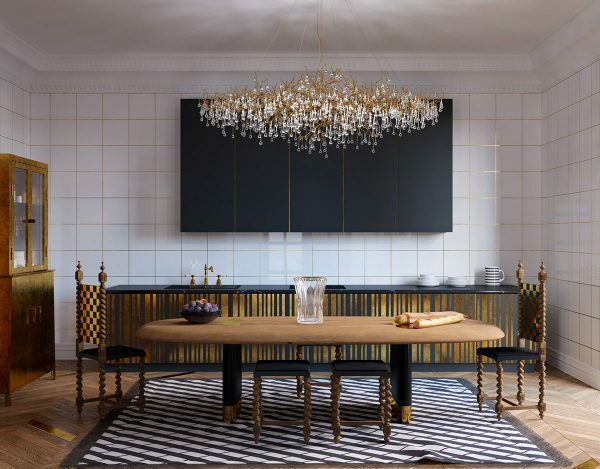 A gold and black beaded chandelier hangs overhead. Black window frames sit darkly in the golden walls. 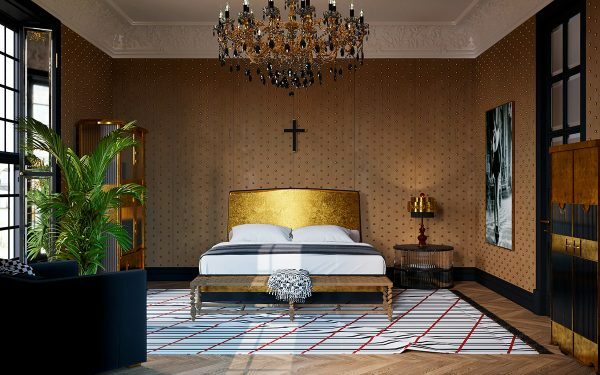 Black and red stripes cross a huge area rug that runs beneath the bed, and connects the sleep space with a vanity table and bedroom chair. Barley twist legs spiral under the vanity stool and a small bench at the foot of the bed. 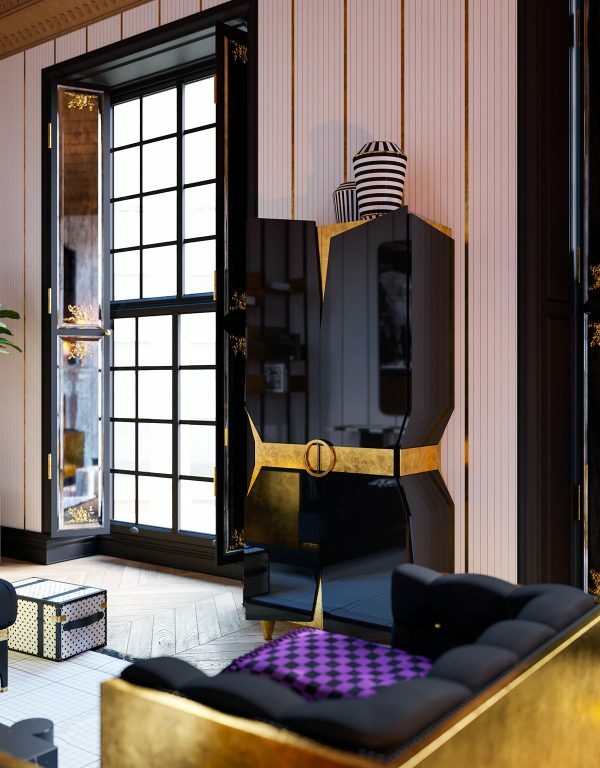 A black and gold leaf storage cabinet fills the corner of the room. 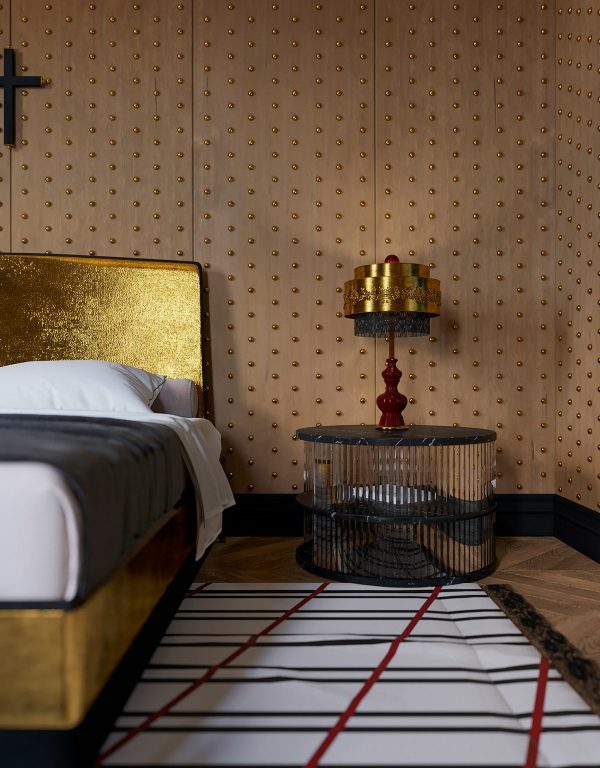 A gold bedside lamp rests on a glass and black marble side table. 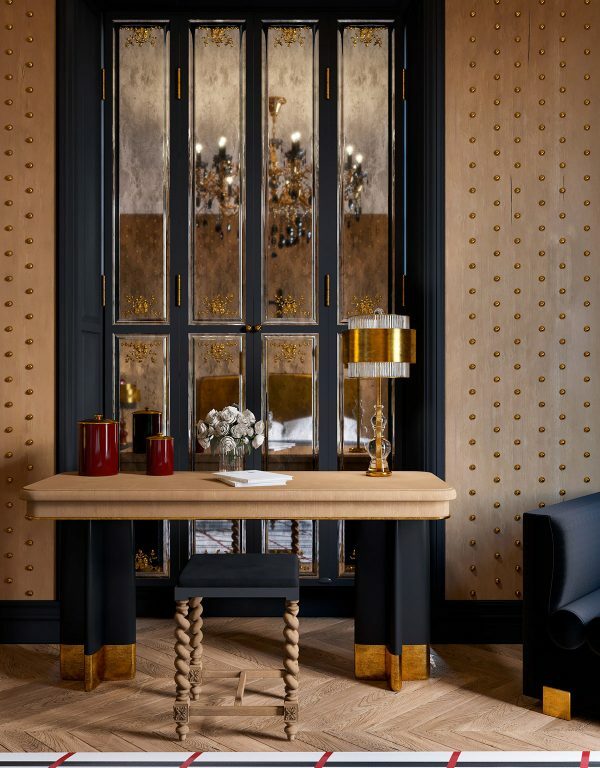 A different gold table lamp accessorises the vanity table/writing desk. Burgundy storage jars match with the red accents in the carpet. The bathroom reads as a regular room more so than a utilitarian wash room, in that the required ‘equipment’ is not the first thing you notice about the space. A chunky, heavily carved round table stands in the room, and it takes a moment to notice that this is actually the bathroom vanity, complete with twin basins. A large striped rug fills the floor and a formal chair stands on barley twist legs by the wall. 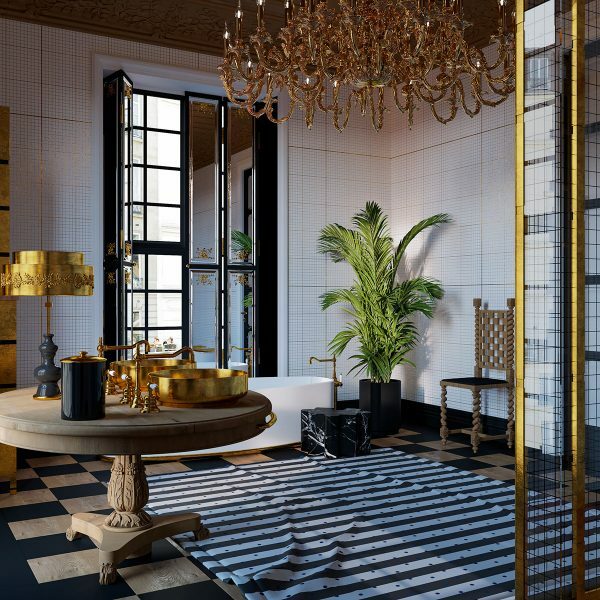 The freestanding bathtub with gold accents is partially screened by a tall and flourishing indoor plant, and a black marble side table. 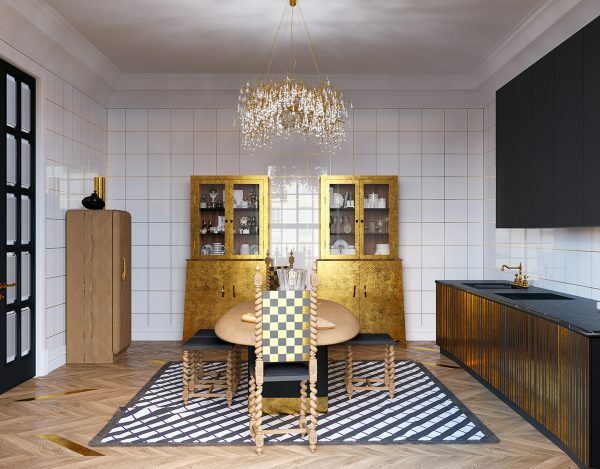 A gold dresser–quite similar to the two that are positioned in the kitchen diner–stands in one corner of the bathroom, in which to store fresh towels and a supply of toiletries. Decorative shutters fold back to let in the daylight and illuminate the unusual bathroom vanity table. Gold towel rails have been fitted around the curved edge of the circular table. 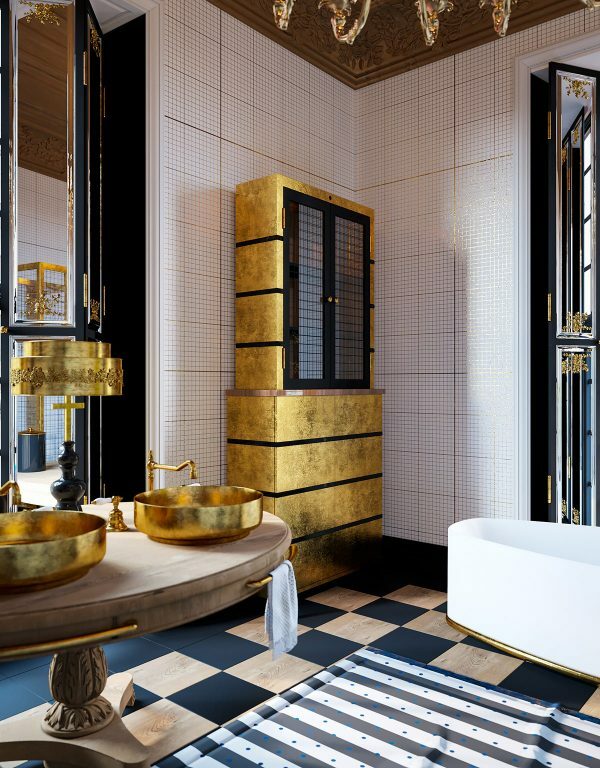 A gold table lamp stands on the tabletop, which further removes this design from a stereotypical bathroom setup. A black and wood chequerboard tile pattern peeps out around the edges of the monochrome stripe rug. Wood planks span the ceiling, with deep and highly decorative wood coving trimming the edges. An intricate gold chandelier raises candle bulbs up on curled arms, to light the beautiful ceiling feature. 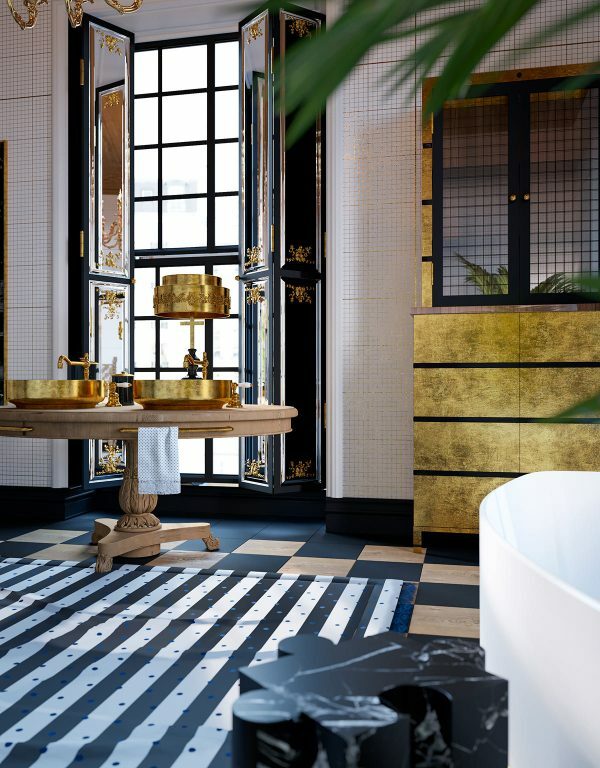 A gold shower enclosure shines in the centre of a wall of white and gold tilework. A black vertical radiator fills the gap at one side, with one section painted metallic. A modern toilet and bidet set have gold enamel inside, with a white exterior. The toilet cistern has been hidden in the wall, evident only by a gold toilet flush plate. 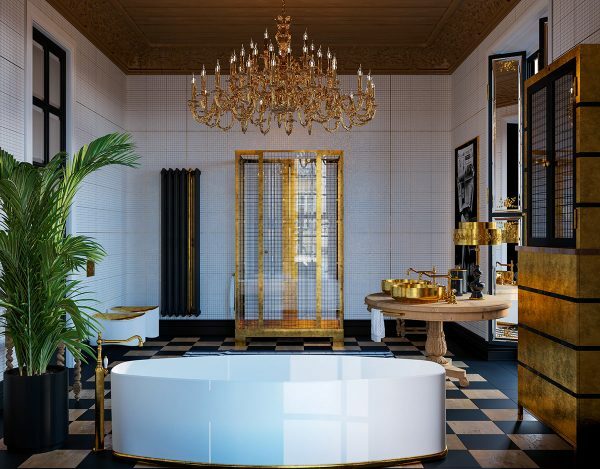 A freestanding gold faucet fills the chic bathtub. Matching gold faucets fill each of the twin vessel basins too. 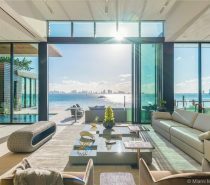 The bifold window shutters are fitted with mirrors instead of transparent glass, so that when closed they might act as a vanity mirror at the basins.